The sea is an integral element of island life, permeating every period of Malta's history. In the Main Hall of the National Maritime Museum, Vittoriosa, we are surrounded by a kaleidoscope of encounters between people and the sea. 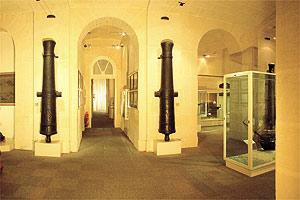 The building that houses the museum is itself an important maritime landmark. Built in the 1840s as the Royal Naval Bakery, it stands on the Vittoriosa waterfront, on the very site where the arsenal of the galleys of the Knights of St John once stood. The guns flanking the doorway on the left are French naval weapons that bear the anagram of the republic and the date 1791. The ship model left of centre represents a Third Rate ship-of-the-line. The model was left without planking on certain sections in order to reveal its internal construction. It is believed that this 18th century model was used as a teaching aid in the Order of St John's famous nautical school. The figures behind it sport the 18th century uniforms of the Captain-General of the Galleys, and the Captain of a Third Rate. The Amati Column, visible in the next archway to the right, dates from 1651, and once stood on the Valletta waterfront in memory of Fra Giulio Amati, a Knight of the Order. In the next archway, a collection of lead stocks and collars from Roman anchors may be seen, alongside some wine amphorae, millions of which were transported across the Mediterranean during the days of the Roman Republic and the Roman Empire. The showcases at the right end of the picture display models of the Order's fighting galleys and ceremonial barges. The painting visible just beyond the cases may be an ex-voto executed in thanksgiving after the Christian victory at Lepanto in 1571, because it depicts the Madonna presiding over a sea battle. This series is appearing every Saturday in collaboration with Miranda Publishers. Photo taken from Museums of Malta 360°.